1. CASE WESTERN RESERVE UNIVERSITY – A Case Western Reserve University engineer won a $1.7 million National Institutes of Health (NIH) grant to grow replacement rotator cuffs and other large tendon groups to help heal injured soldiers and athletes, accident victims and an aging population that wants to remain active. Ozan Akkus, professor of mechanical and aerospace engineering, already devised a technique to reconstitute collagen—a building block of tendons—into tough fibers and induce adult stem cells to grow into tendons on those fibers. FAYETTEVILLE, Ark. — The University of Arkansas will screen the premiere episode ofTime Scanners, a new documentary television series on PBS featuring the Center for Advanced Spatial Technologies, on Tuesday, July 1, in in Ken and Linda Sue Shollmier Hall, Room 250 in Vol Walker Hall. The screening, which focuses on the pyramids in Egypt, is free and open to the public. It will begin at 6:30 p.m. opening remarks from Todd Shields, dean of the J. William Fulbright College of Arts and Sciences. A question-and-answer session with CAST researchers will follow the one-hour episode. Time Scanners took the CAST researchers to historic locations around the world, including the pyramids in Egypt, St. Paul’s Cathedral in London and the ancient desert city of Petra. CAST researchers used their advanced remote sensing technology to collect and analyze billions of measurements to form what is known as a point cloud, which not only provided a 3-D perspective of these structures but also solved some of the enduring engineering mysteries surrounding them. CAST, established in the J. William Fulbright College of Arts and Sciences in 1991, is dedicated to research and applications in geospatial analysis and modeling, remote sensing and digital photogrammetry. Remote sensing is the measurement or acquisition of information about an object without direct contact, such as by satellite imaging, radar or aerial photography. Photogrammetry is the science of recording, measuring and interpreting photographic images or other two-dimensional, remotely sensed data. “Our role in the series is portrayed strongly as the technologists, experts and analysts in gathering and interpreting the data,” said Malcolm Williamson, a research associate at CAST who collected and analyzed data in Egypt and Jordan. Five other current or former CAST researchers participated in the series: Adam Barnes, Eileen Ernenwein, Rachel Opitz, Katie Simon and Caitlin Stevens. A new wave of robotic technology is changing society and in the process, hopefully helping to improve the U.S. economy. We’ve all seen the sci-fi movies where robots are ready to take over the world. But that’s fiction. At Purdue University they’re working on real life scenarios. They’re experimenting with human-like robots called “Baxter.” Engineering and technology students are working to put Baxter in the operating room to help during surgery. The idea is to train Baxter for menial surgical tasks so human hands can be doing more important duties. Baxter could be performing in real life surgery settings in a couple years. Baxter is a pretty incredible robot. It can virtually do any command. If the surgeon calls out for, let’s say, a retractor, it hands it to him within seconds. Three Clarkson University CUPO (Community of Underrepresented Professional Opportunities) students recently received awards at the 22nd annual statewide Collegiate Science and Technology Entry Program (CSTEP) Student Conference: Journeys Beyond Excellence. Kevin Cave, a junior electrical engineering major from Brooklyn, N.Y., received second place in the engineering division for his poster “Speaker Recognition at a Distance.” He was mentored by Prof. Stephanie A. Schuckers and Prof. Joseph D. Skufca. Cleann Davis, a senior psychology major from Rochester, N.Y., was awarded second place for her poster presentation in the psychology division on “The Role of Emotional Acceptance in the link between Motivation and self-regulation.” She was mentored by Prof. Lisa Legault. Peter Vaillancourt, a senior math and physics major from Rochester, N.Y., was awarded second place for his oral presentation in the physical sciences division on “Modeling a Radial Velocity Distribution of Galaxy Clusters.” He was mentored by Prof. Joshua Thomas. Houston, Tex., – March 8, 2012 – Colorado School of Mines, Penn State University and the University of Texas at Austin today announced a new training initiative to support the rapidly growing shale natural gas and oil development sector. The training programs created under the initiative will be led by the faculty at each academic institution and are designed to ensure that regulators and policymakers have access to the latest technology and operational expertise to assist in their important oversight of shale development. ExxonMobil and GE, two of America’s leading energy corporations, today announced they would each contribute $1 million to this new educational initiative. SOCORRO, N.M. June 27, 2014 – Three Tech students won awards through the regional Society of Petroleum Engineers student paper contest at the University of Tulsa in April. Another student won an award for a paper presented at the American Association of Drilling Engineers conference. Pivnicka’s paper is titled “Pressure Prediction of Time-Dependent Drilling Fluids – The Effect of Acceleration.” He studied how fluids and clay particles arrange themselves into something resembling a house of cards over time. This “structure” gives drilling fluids the ability to suspend and carry rock cuttings while drilling. Abdallah’s first-place paper is titled, “Cost Effective Treatment of Produced Water Using Co-Produced Energy Sources.” Working with the Petroleum Recovery Research Center, he he built and tested a process called humidification-dehumidification, or HDH, to treat water produced at oil wells. He found that the cost of treating water is far lower and more efficient that existing methods. Memarzadeh’s second-place paper was titled, “Thermodynamic Analysis of Solvent Assisted Steam Injection.” He studied how steam can reduce the viscosity of in-situ oil to increase production. His study attempts to show how superheated solvents and steam will affect a reservoir at various pressures and temperatures. Memarzadeh is a second-generation Techie. His father earned a bachelor’s in 1981 and a master’s in 1982, both in petroleum engineering. Ampomah’s third-place paper was titled, “Sensitivity Analysis of Reservoir Fluid Effects of Seismic Properties.” His paper offers a modified approach to estimating the probable petroleum reserves that could be found in an underground reservoir. CHAMPAIGN, Ill. — Patients with persistent ringing in the ears – a condition known as tinnitus – process emotions differently in the brain from those with normal hearing, researchers report in the journal Brain Research. Tinnitus afflicts 50 million people in the United States, according to the American Tinnitus Association, and causes those with the condition to hear noises that aren’t really there. These phantom sounds are not speech, but rather whooshing noises, train whistles, cricket noises or whines. Their severity often varies day to day. University of Illinois speech and hearing science professor Fatima Husain, who led the study, said previous studies showed that tinnitus is associated with increased stress, anxiety, irritability and depression, all of which are affiliated with the brain’s emotional processing systems. She decided to use functional magnetic resonance imaging (fMRI) brain scans to better understand how tinnitus affects the brain’s ability to process emotions. These scans show the areas of the brain that are active in response to stimulation, based upon blood flow to those areas. If a virus has got your goat, the sooner you know, the better. Especially if it’s the Caprine Arthritis-Encephalitis Virus (CAEV), which can spread undetected through a herd, reducing the milk production and lifespan of one of the most important farm animals in the developing world. Creating a simple, inexpensive way for farmers to test their goats (or sheep, which are also susceptible) for CAEV is the goal of the first team of undergraduates from Worcester Polytechnic Institute (WPI) to enter the undergraduate International Genetically Engineered Machine (iGEM) competition. iGEM is a global synthetic biology program that challenges students to create biological machines that work within living cells to produce a desired product or process. A program developed at the S.C. university can be downloaded to a tablet, computer or smartphone. CLEMSON, S.C. — With the turn of the calendar to 2014, the political season moves into hyper mode as voters across the country prepare to go to the polls for mid-term elections and local issues. In South Carolina, memories of long lines at the polls and questions about the electronic voting machines are likely to recur. A Clemson University professor says he has some technological solutions to those problems. Juan Gilbert, chair of human-centered computing at Clemson, envisions a time when voters will be able to cast their ballots online without leaving home, and when each vote can be verified without relying solely on electronic data. Things are moving in that direction already, he said. For 10 years, Gilbert and his students have been developing a program called Prime III — Premier Third Generation Voting System — that can be downloaded to a tablet, computer or smartphone. The technology promises to be easier to use, cheaper, more accurate and more accessible to voters with disabilities than current voting machines, Gilbert said. 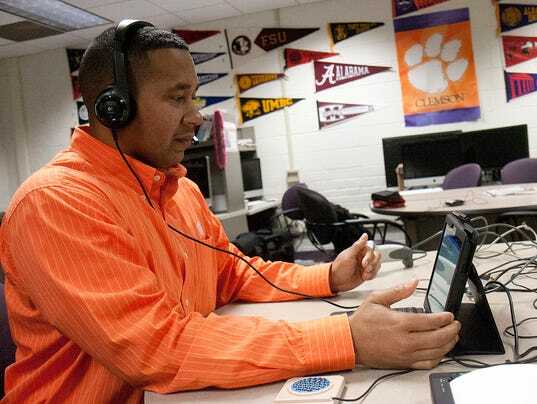 Clemson is making the software available free, and several manufacturers — including the maker of the touch-screen machines now used statewide in South Carolina — are considering it, he said. He said the system will be used later this year in Wisconsin.